The 1808 Capped Draped Bust Quarter Eagle is the only date available for this Coin Type. John Reich came to America from Bavaria as an indentured servant in 1800. He joined the US Mint as Assistant Engraver in 1807. He was immediately assigned to participate in the sweeping redesign US coinage. Reich went to the drawing board first with coins most in demand from banks, the half dollars and $5.00 Half Eagles. In 1808 came the Large Cent and $2.50 Quarter Eagles. In all, he had a hand in the design of no fewer than seven coin types. Reich’s quarter eagle featured Liberty facing left, wearing a contemporary cap of the time. Her bust is fashionably draped. Thus, numismatists call this the Capped Draped Bust Quarter Eagle. However, his work on the quarter eagle was almost a wasted effort. During the years of the early Mint, gold and silver were coined according to the wishes of private bullion depositors, and most of them ordering gold coins ignored the quarter eagle, because it was too large for everyday commerce but too small for inter-bank transactions. As a result, only 2,710 of the 1808 Capped Draped Bust Quarter Eagle were produced. Quarter Eagles were not coined again until 1821, and by then, a different style of gold coin, the Capped Head, was in use. Consequently, the Capped Draped Bust Quarter Eagle design is available only in one date, the 1808. Collectors seeking to complete a type coin set must have the 1808, but supplies are very scarce. Expect the 1808 Capped Draped Bust Quarter Eagle to remain a popular coin forever in the hearts of coin collectors. The 1808 Capped Draped Bust Quarter Eagle as long been a favorite of coin collectors. 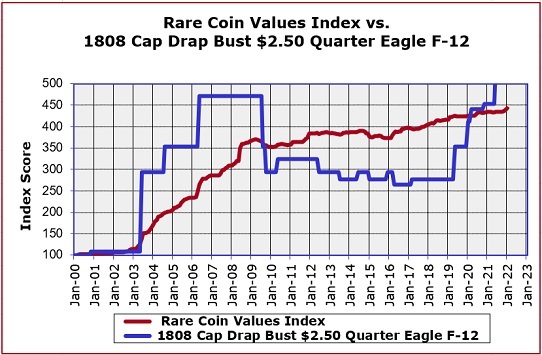 The blue line charts the percent increase of the 1808 Quarter Eagle in F-12 condition since Year 2000. The coin uncharacteristically nosedived in 2009, more than the rare coin market in general, suggesting now might be a good time to obtain this great rarity at discount prices. The red line graphs the progress of our Rare Coin Values Index, which takes the composite percent change since Year 2000 of a pre-selected group of 87 rare US coins, the purpose of which is to understand the strength and direction of the overall rare US coin market. The 1808 Quarter Eagle is one of the 87 coins included in the Index. Everything is updated monthly.